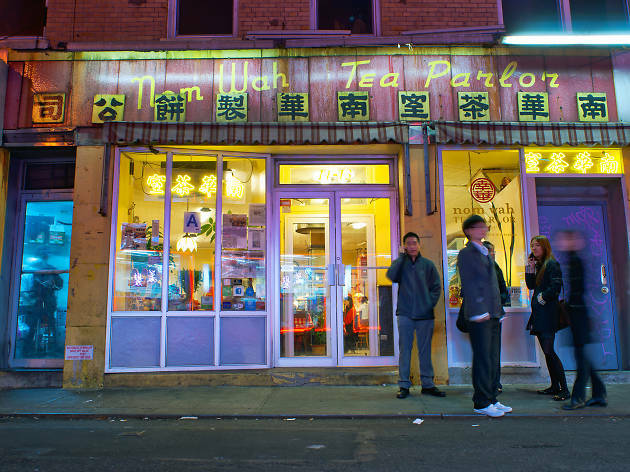 New York's first dim sum house opened in 1920 on a rough crook of gang-riddled Doyers Street. But the bakery and tea shop, at least, had a sweet reputation: Its almond cookies and moon cakes were legendary. Over its near century in business, ownership of the parlor has remained among the restaurant family to preserve its traditions. 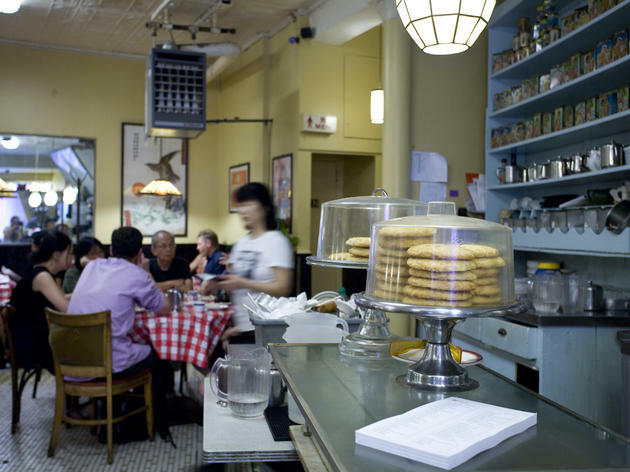 Back in 2010, the stalwart was refreshed with a new interior (vintage lamps, framed archival photographs) and remodeled menu showcasing made-to-order plates rather than dim sum en masse. 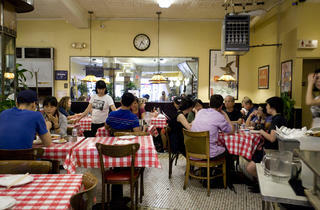 Nom Wah is completely unlike the chaotic banquet halls that dominate Chinatown's dim sum scene. 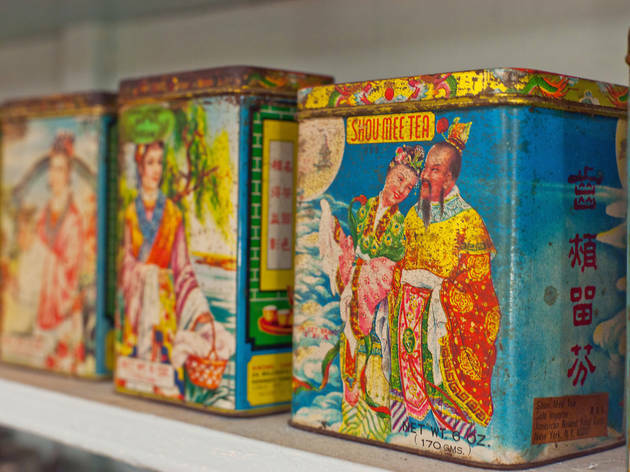 Instead, the dining room is much more charming and welcoming, from the checkered tablecloths over Art Deco tables to the couples huddled beneath old posters of a glam Chinese movie star. The food, too, stands apart; the dim sum here tastes fresher and is more affordable than the competition. Try the ultra-fluffy oversize roasted-pork bun, the flaky fried crepe egg roll and the tender stuffed eggplant filled with a spiced shrimp-and-squid mixture. Plus, it keeps the small plates coming long after other dim sum joints have closed their doors. Been going to Nom Wah for over 20 years. It's awesome, authentic dim sum. It's been taken over by the nephew of the owner and has been cleaned up a bit, but still as charming as ever. Definitely worth a trip. I went with friends, and we were full after only a five plates or so! I was very disappointed in us, but really this means I have to go back a few more times before I feel like I get a real taste of the menu. The soup dumplings, egg roll and sesame dessert were the most memorable. 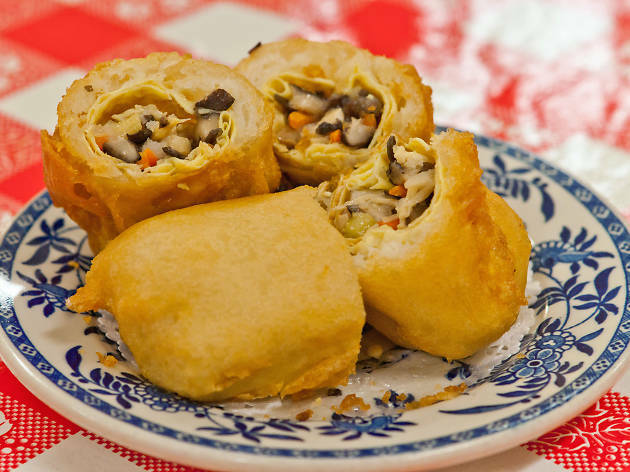 Actually, I’m not the biggest egg roll fan, but the egg roll was the best I've ever had, ever, and totally unlike others that I've tasted as well. Nom Wah has been around for a long time and has been in the same family for a while as well. 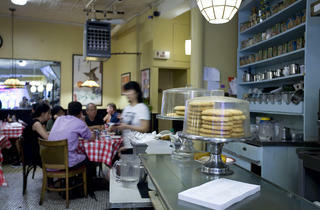 It’s a really cute place with a diner vibe, nestled on a small, narrow street of Chinatown. 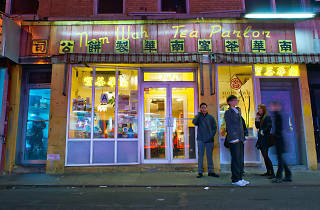 Nom Wah Tea Parlor...A tourist trap whose time has clearly passed after assumption by new heirs. Depressing service vibe. They crossed the line between Quaint and Dingy a while ago. Finalist, Most Likely to Have Bribed a Health Inspector, Rest Room Division. Dim Sum in Flushing is a lot more interesting and pleasurable. 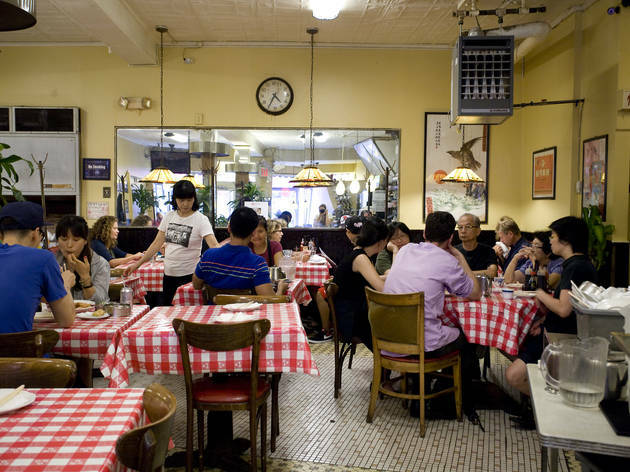 Nom Wah Parlor has been around for a long time and being such a restaurant with history, there are expectations when you try it. While it isn't my favorite dim sum in NYC as there are better options around the area and in the city (Flushing), they have dim sum that'll be up your alley. 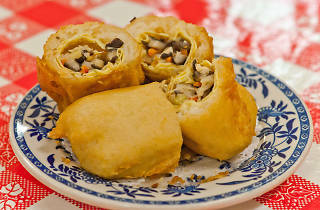 There is the traditional dumplings and egg rolls which are great. The carts that go around are little annoying because sometimes they'll ignore you especially if you're not vocal enough. Service isn't the best either so be prepared if you decide to go. Happy eating and remember: Don't deny, satisfy! It's a nice spot if you want dim sum and it's event better when you don't have to queue for an hour. Its not the traditional way to have dim sum but if you want dim sum after dim sum hrs they have great dim sum all day. Its fun and good place to go. Its delicious. Nom Wah offers a wide variety on the menu. The dumpling soup is delicious! I particularly liked their tea offerings as well. The unfortunate thing is that there is often a long wait. Came here for dinner last night with a friend who regularly raves about this old school Chinatown staple. Definitely not the best dim sum I've ever had, but the atmosphere was cool and it satisfied my craving; I especially loved the egg rolls and vegetable dumplings. Expect a wait here but it’s kind of worth the experience. 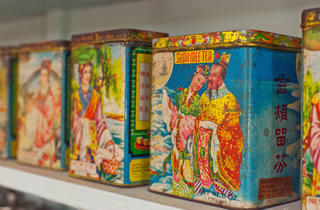 Stepping into Nom Wah Tea Parlor is like stepping into a time machine, this place has been around since 1920. I’m pretty sure it has all its original fixtures, like the painted tin ceiling, old school spinning bar stools and vinyl booths. Now to the food I’ll admit it isn’t the best dim sum in town but it will scratch that dim sum itch or is decent option for the novelty of the dishes. Though the true experience involves those infamous push carts with sometimes equally pushy waiters. I've had some mixed experiences here. 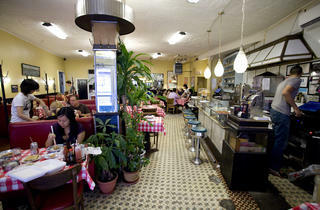 I love the nostalgia behind it, and there are definitely some great dishes, but I feel like it's pretty dirty over all. Is this to be expected from places in Chinatown? Yes, but I think this might cross my threshold surprisingly enough and at least I can say I've been more than once. I've just been for a meal at the Nom Wah Tea Parlour and I was very disappointed. The food was mediocre and the waiter was surly. The restroom was a disgrace - the washbasin looked like it had never been cleaned and there was a puddle on the floor. I would never recommend this restaurant! the customer comes first. Don't know how the other places stay open the way they treat their diners. Really?! I lost all of a lot respect for Time Out's restaurant guide when I see Nom Wah is ranked #1. It's an Americanized tourist destination with pretentious dim sum "authenticity". 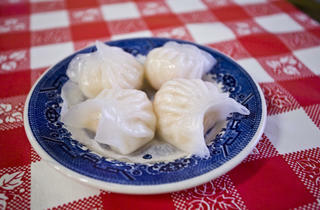 Any serious dim sum fan would not consider Nom Wah's dim sum good quality. 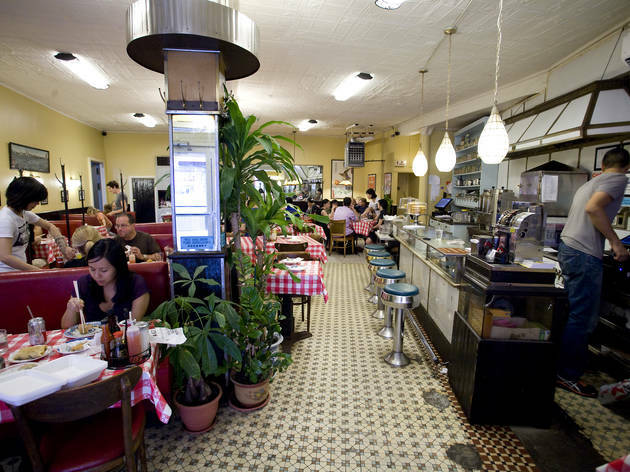 Simply because it tries really hard to replicate an old school ambiance doesn't necessarily make its food good or authentic. If you want a tourist trap experience, yes, Nom Wah has a lot to offer, but otherwise, many of the other restaurant on the list serve much better dim sum than Nom Wah. 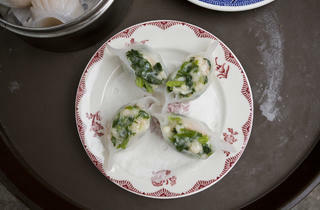 I've been searching for the perfect NYC dim sum place and Nom Wah is it. It's history and legacy aside, the food was delicious (I was served the largest and freshest egg roll that I have EVER seen) and I can't wait to go back. I recommend going in a group so you can try multiple dishes. The Chinese Broccoli in Oyster Sauce was cooked to perfection - most other restaurants keep the bitter flavor in the stalks, but Nom Wah cooks them through so you don't waste anything. I wish I had the capacity to eat more dumplings while I was there, but I guess I should respect my body's limits. The strongest recommendation I have for eating at Nom Wah is ordering tea for the table. Even if you don't like tea, it's part of the experience and really makes you appreciate where you are and what you're eating. The white tea was a great pre-meal drink, and it was also a great cap to the meal. You guys in Time Out definitely know nothing about dim sum. The quality of the food is good, but in terms of the flavor and nuances or originality of great dim sum is clearly lacking. It is ok to good at best. Seem like you are judging the food base on the ambiance or the history of the place. On any particular day, if you walk in to the restaurant you will find tourist with their guide book speaking in any language other than chinese. 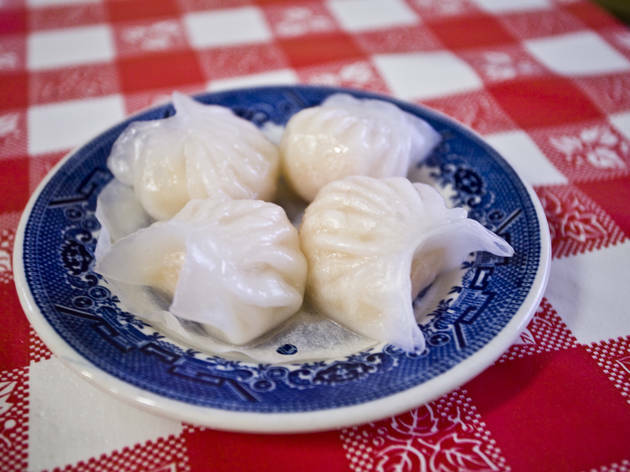 There are many superior dim sum with greater diversity in Brooklyn and Queens. To me, the best dim sum in north america are in Toronto and Vancouver. the food here is undoubtedly great and when you get a dim sum craving at night when most places have stopped serving it, it's nice that nom wah has dim sum on its menu all day. the interior is cozy and charming compared to nearby banquet style dim sum joints. it's on a tiny, crooked street in historic chinatown that makes you feel like you're in a noir film. it's a little overpriced but never disappoints. I went to Nom Wah based on others recommendations. Although the selection of dim sum was diverse, what I was served was decidedly mediocre. My benchmark for dim sum is admittedly a restaurant not in New York City, but compared to my favorite, this place only rates one star. Nom Wah is the OG. Dim sum done the right way for nearly a century. I often take friends here when they're visiting from out of town, because navigating the streets of Chinatown to find a rundown looking Cantonese place on one of the most historic streets in the city would definitely qualify as a "cool" experience. But Nom Wah doesn't rest on its laurels, instead continuing to pump out awesome eats time after time. 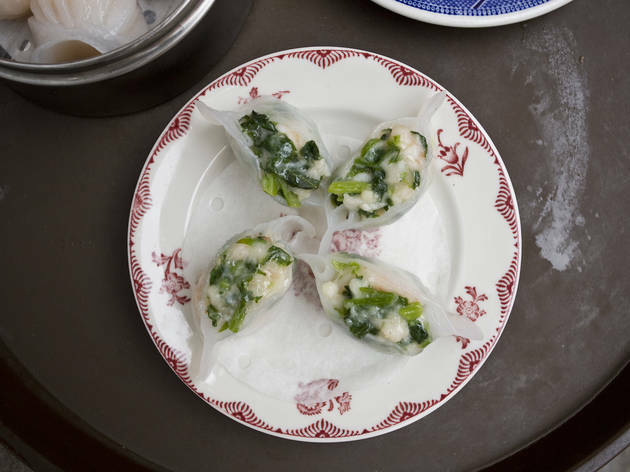 If you're new to dim sum, don't worry. You can't go wrong ordering almost anything on the menu. But do yourself a favor and make sure that includes pork buns, shrimp sui mai, and some pan fried dumplings. I know soup dumplings are all the rage nowadays, but you're better off getting the ones at Joe's down the block.